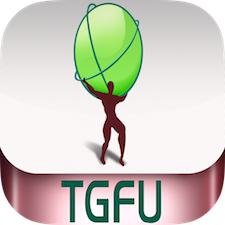 TGfU Games PE is an essential app for all Physical Educators created by Nick Stratigopoulos or @GraciousWolf_PE for all you Twitter folk out there. This app is a comprehensive database of games for Physical Educators and coaches. TGfU Games PE includes more than 200 games for students in Kindergarten to Grade 6 all easily organized into the different TGfU Categories. For those of you who don’t know what TGfU is it stands for Teaching Games for Understanding, a more modern approach to teaching games in a deeper more authentic manner, with tactical understanding and transference of strategies across games. It relies heavily on questioning and allows students to develop not only skills but deeper understanding of how a game works and their roles within a team. The games are split into 4 categories of games and activities that are based on the TGfU curriculum model: Invasion & Territorial, Net & Wall, Striking & Fielding, and Target. A Pursuit & Evade category is also included as an additional game category .You can also easily and quickly search through the 5 categories of games and activities using the alphabetic listing or by recommended grade level. A recent update also allows you to search by sport. This make it incredibly easy to find what you are looking for. Once you have found what you are looking for you are presented with a game sheet which includes all the information you could possibly need to set up the game and keep the students engaged. The only thing that falls short for me is the design of the game sheets. A little more colour and design work might smarten things up a little. I have used the app extensively since its release and it has been a huge help for me. Especially in those times when I am drawing a mental blank as to new activities and games to do with my class. It was also perfect when I unexpectedly was off work for a week with a medical issue. I directed the substitute teacher i(non PE trained) in the direction of the app and she was able to easily find games to play with the classes. « Unveiling: #Soccer PE – Vote for the Graphics!